Scallops are a type of shellfish or mollusk of which the edible part is the abductor muscle. They are creamy white in color with a sweet flavor. There are two main types of Scallops: Bay Scallops and Sea Scallops. 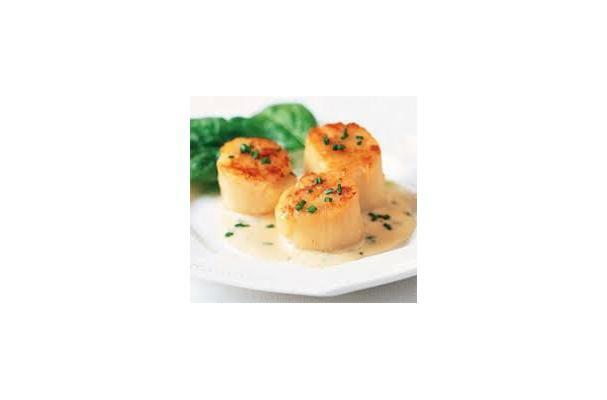 Bay Scallops are small with delicate flavor and texture, while Sea Scallops are tender, larger and less delicate. Scallops are sold shucked and fresh or frozen. They can be cooked in the same way as other types of fish and are often sauteed, deep fried, broiled and poached. Tip: Scallops are often sold wet in their own juices. If you are sauteeing, pan searing, or grilling scallops, it's best to dry them off with a paper towel prior to cooking. This will allow you to get a nice caramelized brown crust or grill marks on them. Bay scallops are very small (the muscle is about 1⁄2 inch in diameter). They average about 100 per pound and their meat is sweeter and more succulent than that of the sea scallop. The muscle of the larger, more widely available sea scallop averages 11⁄2 inches in diameter (about 30 to the pound) and is not as tender as the smaller varieties. Though slightly chewier, the meat is still sweet and moist. The color of scallops ranges from pale beige to creamy pink. Choosing: Look for translucent scallops, that don't appear dried out or yellowed. If they smell strong and amonia-like through the package, look for another package. Buying: Available fresh or frozen and most supermarkets. Scallops can be simply seared and served, prepared into a ceviche (marinated in lime juice), or broiled and wrapped in bacon. They can be breaded and fried, grilled or poached.